If you like cheese as much as we do, you can't help but try this wonderful semi-cured cheese, made from three different milks: cow, goat and sheep. In this wedge you will find less than 52% fat and a curing time between 60 and 90 days, which gives it the title of semi-cured and with which you can enjoy the best flavour and benefits of its three main ingredients. Fresh cheese does not take any time to mature, it is a soft cheese, with a high percentage of water. Due to these characteristics is more easily contaminated and deteriorated. Cured cheese is just the opposite. For a cheese to be considered 'cured cheese', it must have matured for at least 4 to 7 months. 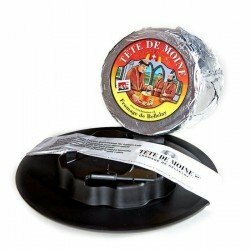 This type of cheese contains very little water and is therefore very fatty and has a strong taste, highly enhanced by this maturation. Apart from this type of cheese, there are also so-called 'old cheeses' which are made with a curing period of more than seven months. Apart from this, one of the most popular types of cheese in Spanish cuisine is semi-cured cheese, a midway point between the soft texture of fresh cheese and the intense flavours of cured cheese. For a cheese to be 'semi-cured', it must have matured for at least 35 days, which means that the taste of the milk can be fully enjoyed, especially when it is made from sheep's milk. Let's start with sheep's milk. Unlike cow's milk, sheep's milk is much richer in fat and protein. This milk has a lower water content, which makes the famous sheep's cheese taste more intense, creamy and aromatic. These cheeses are characterized by their slightly acidic, salty and buttery taste and the many benefits they offer to our health such as their high content of minerals, vitamins and easy digestion. Goat cheese is also more easily digestible and has a high content of nutrients, such as vitamin A, vitamin D, vitamin K, riboflavin, potassium, phosphorus, iron, niacin and thiamine. In addition to this, goat milk is much lower in calories, cholesterol and fat than the rest, perfect for inclusion in diets for weight loss and people with diabetes. Finally, cow's milk brings a softer flavour to the semi-soft cheese and makes a perfect match in the creation of a delicious and nutritious food. Storage: Cold at temperatures between 4 and 8ºC.